Bainbridge Island Artisan Resource Network is a Seattle community facility for artisans to share resources, education, and workspace. To help out this group, Tim Celeski designed a new workbench for the hand tool woodworkers. The space required nine benches built on a budget. Tim added the challenge to make each workbench unique. So, in Rhino, he designed a unique 3D carved leg vise for each bench. 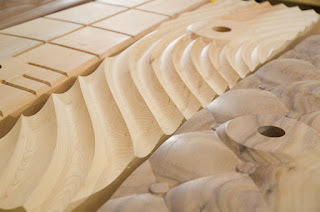 He then used a CNC to carve each vise chop. The CNC sped up the carving and the precision work.